Aha! Not at the Botanic Gardens now: this is Rod Haenni and Ann Priestman's wonderful garden in Bow Mar--and sure enough they had a rash of these appear (all but one of which Rod mowed down). He couldn't resist leaving one clump! This is a different sort of weed: five or six years ago I spied Epipactis gigantea (our rare native cousin to the weed) growing in some raised beds at the Grand Junction Orchard Mesa gardens. I asked them about the orchids and they said they'd appeared spontaneously! One whole bed was almost filled with them and they were weeding them out! I helped and weeded a few out--some of which were sold at Denver Botanic Gardens plant sales! It certainly deserves the common name "chatterbox orchid"! They also had large masses of Epipactis palustris, a European species that spreads rhizomatously but has not been weedy by seed (yet anyway). There are species in east Asia as well--a very interesting genus, I think. It would be fun to grow the less weedy species in a garden. And I know there are mail order nurseries that sell them. 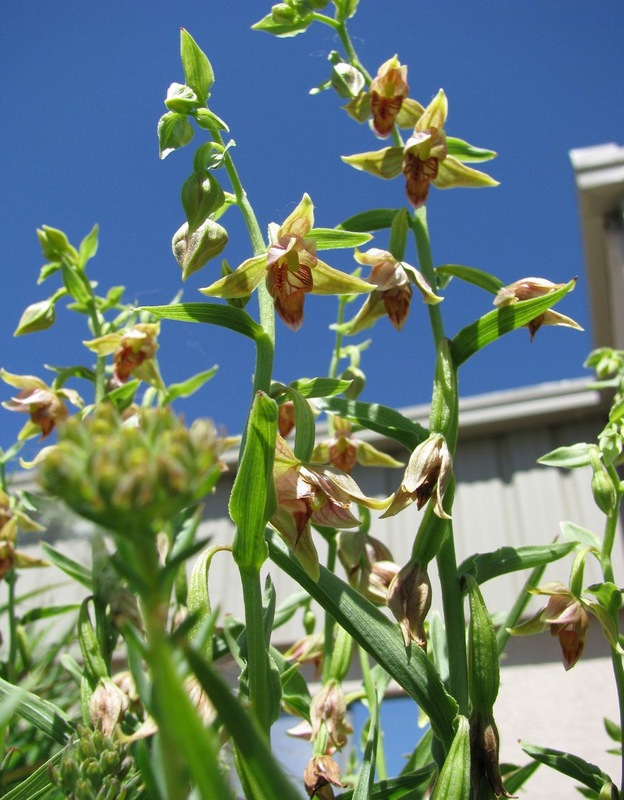 But you may get Epipactis helleborine soon in your own garden--even without trying! I had to laugh thinking of the efforts we go to, to grow orchids. I am going to give up and wait for these guys to find me!